Buddha used breath to do two things simultaneously; one, to create consciousness, and another, to allow that consciousness to penetrate to the very cells of the body. He said, breathe consciously. It is not a pranayama (breathing exercise). It is just making breath an object of awareness, with no change. There is no need to change your breath. Leave it just as it is - natural. Let it be as it is. Do not change it. Do something else: when you breathe in, breathe consciously. Let your consciousness move with the breath going in. 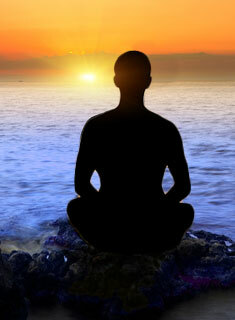 When the breath goes out, move out; go in, come out consciously. Move with the breath. Let your attention be with the breath. Flow with it. Do not forget even a single breath. Buddha is reported to have said, that if you can be aware of your breath even for a single hour, you are already enlightened. But not a single breath should be missed. One hour is enough. It looks so small - a fragment of time; it is not... When you try awareness, one hour will look like milennia, because one cannot ordinarily be aware more than five or six seconds, and that too for a very alert person.Otherwise you will miss every second. You will start, breath going in; but no sooner has breath gone in, and you will be somewhere else. Suddenly you remember again, the breath is going out. The breath has gone out, and you have moved somewhere else. To move with the breath no thoughts should be allowed, because thoughts will take your attention, thoughts will distract you. So Buddha never says, stop thinking.He says, just breathe consciously. Automatically, thinking will stop. You cannot do both - think and breathe consciously. When a thought comes into your mind, your attention is withdrawn. A single thought, and you become unconscious of your breathing process. So Buddha used a very simple technique and a very vital one. He will say to his bhikkhus (monks), "Do whatsoever you are doing, but do not forget a simple thing: remember the incoming, the outgoing breath; move with it, flow with it." The more you try, the more you endeavour, the more you will be conscious. It is arduous and difficult too, but once you can do it, you are a different person, a different being in a different world. This works in a double way: when you constantly breath in and out, you come to your center by and by, because your breath touches the center of your being. Every moment that the breath goes in, it touches your central being. Physiologically, you think that breath is just for the purification of the blood, so it is just a function of your heart, that is bodily...just a pumping system to refresh your blood circulation,to bring to your blood more oxygen which is needed and to throw out carbon dioxide which is an extra, used thing. So you throw it out and renew it and replace it. But this is only physiologically. If you begin to be aware of your breath, by and by you will go deep -deeper than you heart. Then one day you begin to feel a center just near your navel. That center can be felt if you move with the breath continuously, because the nearer you will reach to the center, the more you tend to lose awareness. So when the breath is going in and is just touching your nose, then begin feeling alertness. The more inward it moves, awareness will become more and more difficult, and a thought will come or some sound or something will happen, and you will move. If you can go to the very center, where for a subtle moment breath stops, there is a gap. The breath goes in and the breath goes out: between those two there is a subtle gap; that gap is your center. When you move with the breath, then only, after a very long effort, you will become aware of the gap... when there is no movement of the breath, and breath is neither coming nor going. Between two breaths there is a subtle gap, an interval. In that interval you are at the center. So breath is used by Buddha as a passage to come nearer and nearer and nearer to the center. When you move out, be conscious of the breath. Again there is a gap. There are two gaps: one gap inside, one gap outside. The breath goes in and goes out, and there is a gap. The breath goes out and goes in, and there is a gap. The second gap is even more difficult to be aware of. Look at this process. Your center is between the incoming breath and the outgoing breath. There is another center, the Cosmic Center. You may call it God. When the breath goes out and comes in, there is again a gap. In that gap is the Cosmic Center. These two centers are not different things. But first you will become aware of your inner center, and then you will become aware of the outer center, and then ultimately you will come to know that both these centers are one. Then out and in lose meaning. Buddha says, move with the breath consciously, and you will create a center of awareness. Then once the center is created, awareness begins to move with the breath into your blood, to the very cells, because every cell needs air, and every cell needs oxygen, and every cell, so to speak, breathes... every cell. And now scientists say that it seems that even the Earth breathes. And because of the Einsteinian concept of an expanding universe, now theoretial scientists say that the whole universe is breathing. when you breathe in, your chest expands. When you breathe out your chest sinks. Now theoretical scientists say, it seems that the whole universe breathes. When the whole universe is breathing in, it expands. When the whole universe breathes out, it sinks.In the old Hindu Puranas (mythological scriptures), it is said that creation is Brahma's one breath - the incoming breath. And destruction (pralaya), the end of the world, will be the outgoing breath. One breath is one creation. In a very miniature way, in a very atomic way, the same is happening in you. When your awareness becomes so one with breathing, your breathing takes your awareness to the very cells. A ray now penetrates, and the whole body becomes a Buddha's body. Really, then you have no material body at all; you have a body of awareness from within.